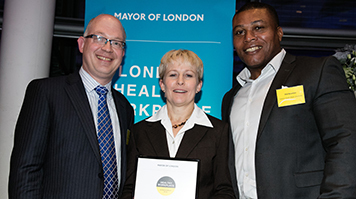 LSBU has this week received a Mayor of London Healthy Workplace Charter Achievement Award, joining the ranks of just 140 London organisations to have attained the prestigious award to date. With the exception of the University Hospital NHS Trusts, LSBU is the only university to achieve the accreditation, which aims to create happier and healthier workplaces across the capital. The award was presented at City Hall to LSBU personnel Phil Newman, Head of Sport and Recreation, Andrea Allen, Wellbeing Advisor, and Ed Spacey, Head of Health Safety and Resilience. It follows a rigorous and extensive evaluation process, which included the production of a substantial bid document, presentations, evidence submissions and panel interviews. The people-focused scheme, which is endorsed nationally by Public Health England, is designed to help organisations improve their business outcomes through activities which create better engaged and committed staff. This can be measured in part through higher staff retention levels and reduced absences, which in turn reflect a happier and healthier workforce. Physical exercise has been prioritised by LSBU as a core component of its wellbeing programme and activities initiated to support this include gym classes, free yoga sessions, lunchtime walks, and garden clubs. Other benefits for staff include regular health checks, including blood pressure and cholesterol checks, and free flu jabs. Stress awareness and management classes also feature. Ten LSBU Wellbeing Champions have been appointed to help ensure the implementation of the Charter and, according to Ed Spacey, have already made a big impact on the programme. Find out more about health and wellbeing at LSBU.